ALVA, Fla. - Waterkeepers took samples of the green algae blooms to have them analyzed for potential toxins. "Sometimes we call it the cell from hell because it is so capable of causing problems," said John Cassani as he looked at the blooms at the Franklin Lock and Dam in Alva. Cassani is a Calusa Waterkeeper. His job is to monitor the bloom as it heads west. "Folks in Fort Myers and Cape Coral will start to see it," Cassani said. "It'll be similar to what we saw in 2005, 2015, 2016, and even a little bit like last year," he added. 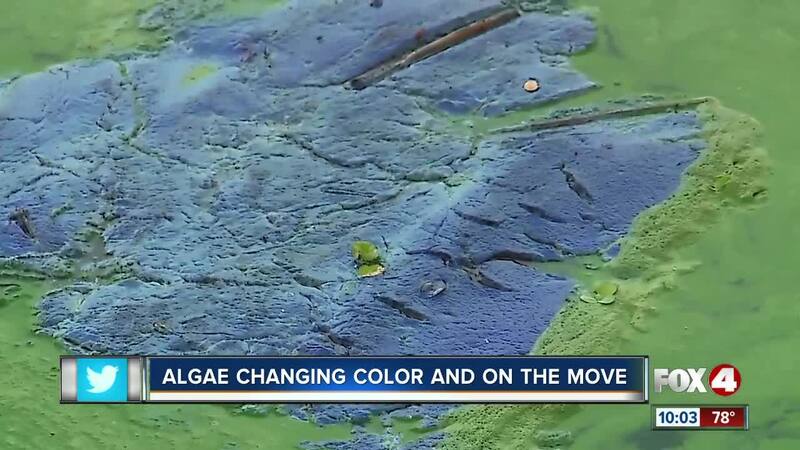 The green algae are floating west along with the natural flow of the Caloosahatchee. The blooms have already been reported in Labelle and Alva. Cassani noticed a color change in the bloom. "We're seeing the evolution of this bloom go from a green to a blue color, which is not a good sign," he said. He wants to warn people about the potential dangers the bloom could have if it produces toxins. "It has the potential of carrying a liver toxin and a neurotoxin," Cassani said. "It could cause liver function problems if you get enough of a dose," he added. He sent the samples to a lab to analyze the toxins. He expects to know in a couple of days if the toxins from the blooms will become a problem.